Database developer Bob Clayton started playing drums as a fifth grader in Allendale, Michigan. "I played in various rock and heavy-metal bands," he says. Clayton got into guitar and piano years later, after graduation from South Eugene and the UO. In 2000, he contacted Station 7 about mentoring at-risk teens. "I was an at-risk teen," he explains. "I had mentors who made a huge difference." Clayton launched the ACCHORD Music Mentorship Program, part of the ACCHORD non-profilt that provides Music for Healing in area health-care facilities. AMP volunteers have since given more than 1000 lessons, and AMP has given 18 guitars to students who completed 10 lessons. AMP students have recorded two CDs. 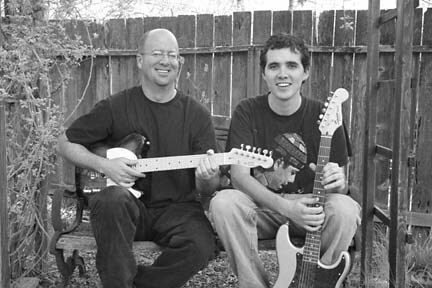 A Bend native, a UO student, and a jazz guitarist, Stu Sandine volunteered for AMP after he found it on Craig's List. "Right now I give lessons once a week," he says. "There's a group of regulars and others just giving it a shot." As of last month, Sandine has taken over as director of AMP, while Clayton has retired to spend more time with his own kids. Learn more at musicmentorship.org.